So, here’s a thing I should probably address — a bunch of people have asked me if it’s in my plans to move to Portland. The short answer is, probably-not-but-also-maybe — the long answer is just as complicated. I moved to Chicago four years ago this week, on October 25, 2010. I saved up for six months, quit my job, and came here to be unemployed and make all-new friends in a city where I knew almost no one. I freelanced for a newspaper for a few months before starting at Groupon, and I made fast friends with my new roommate and coupon factory co-workers. It worked out in the end, but it was extremely difficult. I promised myself I’d never move to a new city without a job again because it was something I hadn’t thought through enough before taking a huge risk. I was lucky it had panned out, and I knew it. I love Chicago so, so much. I’ve made lasting friendships here, and a life for myself. It took a while, but I finally got my career back on track by getting a marketing position that I truly enjoy and feel confident doing. I live in an apartment I can afford and have at long last separated myself from a soured relationship. Once some stability comes my way, of course, my need for change is not far behind. I’ve always been a little like this — restless, and looking for the new big change, the next bold move, the future thing(s) to plan. Portland is appealing for a lot of reasons. Tri-Met, Portland’s version of the CTA, mailed my wallet back to me the weekend after I got home. It remained untouched, from my Illinois license ID to the $4 cash I’d had tucked in it. I was astonished and thankful. I loved my time out there, and felt truly welcomed by strangers in a way I didn’t expect. It’s a city, but on a smaller scale, where maybe I could be a bigger fish in a somewhat smaller pond. Maybe I could found Story Club Portland? Or I could start a hyperlocal news site about a neighborhood there, handing off 60625 to the next wave of Albany Park and Lincoln Square writers? Portland is bike-able year-round, and no one has to clear snow off of their cars. It’s also gray eight months of the year and last week I nearly had a meltdown because it rained in Chicago for five days straight. Portland is far away from the places my ex and I used to go during three of my four years living in this city. It’s also 2,000+ miles away from my home, my family. Airfare to Columbus from Portland costs a lot more than it does from here. It’s worth noting that Portland is technically (very slightly) higher than Chicago in terms of cost-of-living. There are plenty of reasons to move to Portland, but also lots of reasons why not. Many things would need to happen before I could make another, bigger move. If my work let me stay on remotely, that would be an amazing start, but that’s a pretty big ask coming from someone who’s worked there only six months. Yes, I did get a welcome-home present from the city of Chicago in the form of a parking ticket for street cleaning. Yes, I did feel pretty disenchanted when men shouted obscenities at me twice before 9 a.m. while I rode my bike to Target the Saturday after my trip, after riding around unbothered for days in Portland. Yes, the idea of another polar vortex is surprisingly crippling. But this is something I plan to spend this winter thinking about. I have to hope this one’s nothing like the last, because I just don’t think I can take it. We never truly had a summer here, and now it’s about to get cold and windy all over again. That is not a cheering thought. What IS cheering is that I’ve got the next few months to spend time with my friends here, all of us making each other get out of the house and resist hibernation. I’ve got live lit readings calling my name and a passion for something new to keep me motivated. I’ve even been getting tapped for paid freelance writing more and more lately, which is kind of unbelievable but extremely encouraging. If I did move to Portland, it wouldn’t be until well into 2015, and as I said, a lot of things would need to happen before then. It would also be nice if I could visit there again soon, when it’s NOT 80 degrees and gorgeous — just to be on the safe side. Maybe this is just how I will always be? Moving from city to city every three or four years — Columbus to Chicago, Chicago to Portland, and then what? Will I never feel content in one space? I’m honestly not sure. That life sounds equal parts exhausting and thrilling and I honestly don’t know what to do with it. I just need to do what’s best for myself and go from there. This is day five, and the final installment, of my series about my trip to Portland and Seattle. Start with day one here. The fish guys at Pike Place Market. I woke up before my alarm on Monday morning, momentarily confused about where I was. Slowly I remembered I was in Seattle, and specifically in Evan’s apartment, and I got up to get ready for the day. I was flying home on a 2 p.m. flight, but I had until noon to see more of Seattle. Evan and I left his place with my stuff and got on a bus to go downtown. He took me to his office, where we stowed my luggage, before walking to get coffee and see Pike Place. It was pretty early for a Monday, just after 8 a.m., and a lot of the vendors were still getting set up. We did walk into the original Starbucks, just to see it, and I saw giant bouquets of beautiful flowers I’d never seen before, for $5 each. I remembered a co-worker had told me a story of a friend who’d gotten married in Seattle and was able to get all of her wedding flowers at the market for something like $75. If I hadn’t been about to get on an airplane, I’d have been tempted to buy some for myself. We got some amazing cheese curds from a friendly vendor and continued to walk around the area. The view from the public space on the 17th floor. Evan took me to a really neat feature of Seattle: In this one building downtown, anyone can access the 17th floor and enjoy a beautiful public space, overlooking the city and Puget Sound, complete with picnic tables and a landscaped patio. It was stunning. “This really is a beautiful city,” I said to Evan, and he smiled. I’d made plans the night before to meet up with my high school friend Jesse before his class at noon. He commutes from Lacey to Seattle five days a week for school, where he’s getting his masters in Middle East studies. He’s learning Hebrew and told us about his recent trip to Israel, and also about his wedding from this past June. It was very surreal to see a friend I only ever see in Ohio in a city I’d never been to before, and it was nice to catch up. The three of us ate breakfast together at a French bistro Evan liked, and it was delicious food in a cute atmosphere. Jesse left for class, and Evan took me back to his office to get my bags. He walked with me to the train stop and waited with me on the platform until the train heading to SEA-TAC arrived. I hugged him goodbye and got on to head home. I was sad to go, but also relieved I had my passport and a way to get back to Chicago. It had been great to see Seattle with a guide, and especially one so excited to be in the city in which he lives. I left Seattle feeling happy, thankful, and full of amazing food. Me with Evan at breakfast. A crumpet shop my friend Dennis likes. The famous Pike Place Market sign at the entrance. Inside the original Starbucks, at Pike Place. The gum wall. It’s a thing. Evan enjoying the cheese curds he got for us to share. A neat tree on the deck of the 17th floor public space. Trash, recycling, AND composting at the airport. This is day four of my series about my trip to Portland and Seattle. Start with day one here. The water everywhere was so blue in Seattle. I woke up late Sunday morning. I am an idiot and set the weekday alarm for 6:15, not the weekend one. I woke up instead at 7:39, about 20 minutes after I’d planned to leave the airbnb for downtown. My heart stopped. I asked Siri to call a cab, trying to remember how much cash I had remaining from what my bank had let me take out. A cab had definitely not been in the budget, but I couldn’t think of another option. The buses only run every half hour or so on Sundays, from what it looked like, and I’d missed the one I had planned on catching. The cab company told me one would come for me in 10 minutes. Luckily the night before I’d packed everything and left out a note and some small gifts for my hostess, so all I had to do was get dressed, strip the bed, and start a load of laundry before leaving. I did all of this running back and forth like crazy, and I hurried while trying to make sure I wasn’t leaving anything behind. It occurs to me now that I did leave some half-and-half and a chunk of brie from Trader Joe’s in the mini fridge. The cab got there just when I was told it would, and the driver loaded my bags into the trunk. He was taking his time, not seeing my panic, so I told him my bus was leaving in a half hour. He told me not to worry, and he was right. We got downtown maybe 10 minutes later, and I was one of the first to board the Bolt Bus. I tipped him 25 percent despite my dwindling funds because he saved me a huge headache. There’s no way I could have purchased a second ticket for a later bus online without my debit card, and I’m not sure they let you pay cash for a ticket on the spot. My carelessness was once again rewarded, so I’m sure this means I’ll learn nothing from the experience and continue to blunder through life relying on the kindness of strangers. As I stepped onto the Bolt Bus, I dropped my wallet on the floor, my hands too full of luggage and my giant pink Voodoo Donuts box. I bent over to pick it up. “Oh no, you don’t want to lose your wallet,” someone already seated joked. “Yeah, that would be bad!” I replied, laughing a little too hard. A park near Fremont Brewing. Bolt Bus is kind of like a northwest regional version of Mega Bus. It spans cities like Seattle and Portland but also Vancouver, BC and Eugene. My ticket had cost only $23 and I was told if you book at just the right time you can get them even cheaper. The bus ride from Portland to Seattle was less than three hours – we somehow got to downtown a half hour earlier than scheduled. I stepped off the bus carrying my bag and my Voodoo box, and a man waiting outside the bus smiled at me. “You clearly just got in from Portland!” he said. “Yup,” I said with a smile, slightly lifting the box up to show it off. This was not the only time that box of donuts would be commented on – as I crossed a street minutes later, a man driving by yelled “Voodoooooo!” out his window at me. I killed time in a coffee shop waiting for Evan, and people eyed the box sitting on my table with curiosity. After Evan came to get me, he and I walked to a bus stop. A man holding a large Starbucks cup came up to him, as Evan was now holding the box, and asked him if he could have a donut to go with his coffee. He was not kidding. “We have people waiting on these,” Evan said apologetically, thinking much faster than I would have. This was a lie, because we did not – we were going to eat all of those donuts ourselves and with no remorse. Since it was Sunday, the banks were closed. Evan is a genius and Googled up the idea to go to a Money Tree to see if I could write myself a check and cash it there. With my passport serving as proof of ID, the woman at Money Tree let me cash a check. They charged a 6% fee, but I didn’t care. She was helpful and asked me how Portland had been aside from that obvious hurdle. I told her I’d loved it, and had the Voodoo Donuts to prove it. We took a bus to Evan’s apartment in Queen Anne and dropped off my things. We split a bacon maple bar from the box of donuts, and I was glad it had held up over the last 18 hours. While I got settled in, Evan put on an album by Lucy Michelle and the Velvet Lapelles, which I’d mentioned loving and listening to a lot while preparing for my trip. I admitted I’d been listening to it on loop most of the bus ride up, and was so excited that he thought to put the record on. A view from the way up to Upper Queen Anne. We left to explore, first winding up a street with amazing views to Upper Queen Anne to check out the shops and restaurants. Evan asked me if I wanted to see the “troll under the bridge” on Troll Street, and I had pictured it in my mind as a painted mural. Instead, it’s a giant, stone-carved troll, who looks as though he is bursting through the ground, crushing a car. Then we headed further north and went to Fremont Brewing. I celebrated having an ID again by getting an amazing flight of five samples of their beer. Having eaten nothing but one and a half donuts all day, the tiny samples hit me faster than they would have normally, so we walked it off by heading over to a nearby park overlooking one of Seattle’s many lakes. Then we took a bus over to the Capitol Hill neighborhood. For dinner, I treated Evan to the fanciest meal of my trip, finally getting the seafood I’d wanted all week. We split an amazing bottle of wine and entrees of king salmon and lamb shank, with ratatouille and couscous. I finally got my Pacific Northwest salmon. It was amazing. After dinner, we walked around that area more and ducked into a great bookstore before getting ice cream at Molly Moon’s. On the way back to his apartment we stopped to get a six-pack of Deschutes Brewing’s winter ale, called Jubelale. It reminded me of Great Lakes’ Christmas Ale, my favorite seasonal beer of all time. We drank a couple of those while watching “Jiro Dreams of Sushi,” a fascinating documentary about a tiny sushi restaurant in Tokyo. I’d heard about it a long time ago and it seemed appropriate to watch since I too had been dreaming of sushi in Portland. I’d missed Evan so much, and it was just so great to get to catch up with an old friend and fill each other in on what we’d missed since he moved in the spring. We stayed up a little too late, since I sort of forgot the next day was Monday. Evan had taken the morning off to show me Pike Place, but he did have to go in after I left. Seattle, Day Two will be posted later this week. This is day three of my series about my trip to Portland and Seattle. See day one here, and day two here. Despite being up so late the night before, I still failed to sleep in on Saturday. I never really did manage to sleep well at the airbnb for some reason, even though it was really comfortable there. I made coffee and tried to do some writing, but all I really wanted to do was shower and get out the door. I’d woken up to the news that it was now in the 30s in Chicago with reports of sleet. While it made me all the more glad I was in Portland, it was depressing because I knew it was going to make it that much harder to go back home after a beautiful week in the Pacific Northwest. It was sunny and in the 80s with no humidity almost the entire time I was there. That said, everyone I talked to reinforced that this was not normal October weather. I washed my dishes at the airbnb and grabbed my stuff to leave. I biked back to downtown and felt immensely proud of myself because I didn’t need to stop to check directions on my phone even once. By my last full day in Portland, I’d finally gotten a decent grasp on cardinal directions and the general layout of major streets. I went to the Portland Saturday Market — a huge outdoor artisan crafts and food market downtown — and got a chicken shawarma sandwich from a food cart for lunch. I bought myself a new wallet at the market, a cute yellow and blue hand-sewn one. I put the rest of my cash in it and guarded it with my life. I also bought small gifts for my airbnb hostess (artisanal soap) and for Adele (gourmet dog treats for her adorable new dog), to thank her for mailing Evan my passport. Evan texted me Saturday morning to tell me to rest easy – the passport had arrived. I could’ve cried. All I needed now was for my stupid debit card to show up at the airbnb and I’d have an almost normal existence again. I found myself reluctant to admit to people I met and talked to in Portland about my wallet right off the bat. I didn’t them to think I was scamming them and about to ask for money, and I was also embarrassed that it had happened at all. I only mentioned it when it came up or after I’d been talking to someone for a while. I knew there was no use in trying to tell people who carded me my sob story. Anastasia had told me earlier that Oregon has really strict bar and liquor laws. After checking out the market, I rode over to Powell’s and mourned all the books I wanted to buy but would not let myself spend the cash on. I walked around that downtown area before moving toward SE Portland. I went north and found a coffee shop near Voodoo Too, where I could wait for Anastasia to answer a text I sent her. It was a strange coffee shop called See See Coffee & Motorcycles. It was filled wall-to-wall with motorcycle helmets, gear, and memorabilia. They had a limited menu but when I ordered some toast, the guy behind the counter said they were out of bread. He offered me a hot dog instead, and by then I was starved so I said yes. It turned out to actually be an extremely spicy brat, and after two bites I couldn’t eat anymore because my mouth was on fire. Anastasia texted me back and said she wouldn’t actually be at Voodoo Too at the time she thought she’d be, but that she’d told the manager on duty there that I’d be coming. I walked the bike a couple of blocks over and joined the line of about 35-45 people snaking outside the place. When I reached the front of the line, I sheepishly said I’d been told to come there by Anastasia. The manager was sent for, and I was welcomed like an old friend. She told a girl behind the counter to set me up with an assortment and not to charge me. She filled up their biggest pink box full of around 10 or 11 huge donuts. I left a few dollars in the tip jar and thanked everyone emphatically. The line outside Voodoo Too. I had to take the bike back to April after that, which was close to Voodoo Too, but a little tricky to maneuver because of the giant box I was now carrying. I contemplated strapping the box to the rack on the back but I didn’t think my earbuds would be up for the task this time. Instead, I balanced the box on my left arm and controlled the bike with my right and rode on. I laughed at the image of myself just then: A hipster-dressed, beaming girl pedaling a box of Voodoo Donuts by bike — the complete image of a Portlandia stereotype. I stopped by the coffee shop I’d went to Thursday morning, where Kim had given me a free cup of coffee, but to my disappointment, they had closed two hours earlier. I wished I’d thought to write a note and put it with some cash in an envelope, but I didn’t have anything like that with me. Instead, I moved on to April’s. April welcomed me and the bike back warmly. I told her about the broken light bracket and what the bike store had said. I offered her some cash for a new one, but she said she wasn’t concerned and that Phil would know what to do. I told her about my adventures and where all I’d been. I mentioned In Other Words, and she said one of the women who takes her yoga class is on their board. Small city. She gave me a goodbye hug and I went on to catch the same bus that had brought me to her days earlier. For the hell of it, I went into a Plaid Pantry convenience store to try to buy some local beer, even though I knew I’d get carded. I was, immediately, so I settled for some gummy bears instead. I walked out only to see the bus was at the stop a few minutes early. I ran for it, knowing what happens whenever you do this in Chicago: 75 percent of the time that bus driver will let you break into an undignified, flailing sprint only to leave you choking in the dust without a glance backward. But this bus waited, and I stepped on, breathless. “Thank you,” I gasped, and the bus driver nodded politely. I dug for my new wallet but she said she wasn’t going to make me risk dropping my box of donuts for a $2.50 fare, and told me I could just sit down. When I got back to the airbnb, I checked the mail, holding my breath, but there was nothing there. The debit card never arrived. I made a note to myself to ask my hostess to destroy it whenever it did eventually show up, long after I was gone. I had a pretty low-key final night in Portland. Kyle, the guy from the night before, texted and we talked about maybe making plans, but I admitted I was a little too tired to have another late night out. I told him to call if he was ever in Chicago and that it had been great to meet him. I packed and set an alarm and fell asleep around 11, the earliest I’d gone to bed any night of the trip. Seattle, Day One will be posted later this week. This is day two of my series about my trip to Portland and Seattle. See day one here. Interesting plant life by a bike path in NE. I slept fitfully Thursday night. On Friday morning, I woke up in a panic, feeling so worried about my wallet. After some thought, I texted my airbnb hostess to let her know she’d be getting an envelope from my bank in her mail with my new debit card. I hadn’t wanted to say anything about my wallet to her for fear of worrying her or maybe making her think I was a chaotic person to whom things like this happen constantly, but I knew I needed to ask her to watch the mail. Minutes after I texted her, she called me to offer assistance. I thanked her but told her I was handling the situation and doing everything I could. My airbnb was a fully furnished, finished basement suite with a bathroom, kitchen, small couch, a huge TV, and a very comfortable bed. I had a private entrance and lots of space. The kitchen had a microwave and a coffee pot, so I made some oatmeal while some coffee brewed. It occurred to me that morning that an old Microcenter retail credit card I rarely use might have been in my wallet, and I hadn’t thought of it the day before when I cancelled my Chase cards. I sipped my coffee and called Wells Fargo. The balance on the card was still zero, but I cancelled it anyway just in case. I decided I’d better tell my dad what had happened, now that things were looking like I hadn’t had my credit cards compromised. He said he’d had a strange feeling something bad had happened. It was true that I hadn’t been posting the cheerful Facebook updates he’d probably been expecting during a trip I’d been looking forward to so much. He offered to help me pay for a flight out of Seattle a day or two later if I needed to wait for my passport. I hoped it wouldn’t come to that but thanked him. He told me he was proud that I’d been able to handle a really awful situation on my own and not have a complete meltdown. “Oh, believe me, the meltdown’s coming,” I said. I rode my bike to Tasty n Sons, a place I’d read about for good, not-crazy-expensive brunch. I proudly said “just one today” to the hostess and was seated at the bar. I ended up next to a woman named Patty, who was from eastern Washington, and two of her friends. They were all in their 40s or so. One of the friends, Colleen, lived in Portland and gave me her cell number in case I needed anything during my stay. They invited me to a happy hour that night but when I looked it up later I saw it was probably a little further than I should bike. I walked around a street full of shops by the brunch spot after the women left and I was on my own again. I went into a coffee shop there with my laptop and the two baristas gave me tips on where I should go in Portland. One of them had recognized my Ohio necklace and asked if I was visiting. I told them I grew up in Ohio, but was visiting from Chicago. I told them I’d be going to Seattle next. “Watch the guys throw the fish!” one of them said. So many people said to go see the fish get thrown at Pike Place Market. Laurelwood Brewery in the Hollywood District. While I was at the coffee shop, Jaimi texted me to let me know a friend had told her if I got a police report for my stolen/missing wallet, proper documentation might help coax the airport into working with me. The coffee shop was within a mile of a precinct so I rode over there. I had to wait a while, but after about 45 minutes an officer took down all my information. He even printed a copy for me and waived the $10 fee, since I’m traveling. I didn’t know if my airbnb host had a printer, nor did I want to bother her and ask. I rode back home and tried to worry less about the airport situation. Losing my ID was far worse than losing my debit card, thanks to the helpful banker who let me get cash out. Relying solely on cash was nerve wracking, but it was also making me much more conscious of my spending than I usually am. I thought about taking a nap, but stayed up anyway. I ate a breakfast burrito from Jack In The Box for a quick dinner. Jack In The Box was the closest food to my airbnb and I remembered being surprised by how much I liked it when I visited Eileen in San Diego in February. My brother called, having talked to my dad earlier that day, and he wanted to make sure I was okay. I told him what happened, but again stressed that I didn’t want the wallet incident to overshadow all the great stuff I was getting to do and see in Portland. He understood. I texted Adele to see if she knew when the passport was supposed to arrive in Seattle, and she told me she’d overnighted it there and was promised it’d get to Evan by 3 p.m. Saturday. I thanked her profusely and texted my dad and brother to tell them. I looked online for a local brewery near me and found one a mile and a half away. I scouted out their menu and decided to get their beer flight to try a sampling of what they make. I grabbed only enough cash to pay for the flight, a pint, and an order of nachos plus tip and biked over. It was called Laurelwood Brewery, and I was at their NE Portland location in the Hollywood District. I ordered the flight and as the bartender grabbed a set of tiny glasses, he asked if I had my ID. I grimaced. I told him no, and to never mind the flight. I told him my wallet had been stolen, but I knew it didn’t make any difference. I apologized and he did too. I walked out of Laurelwood, unsure of where to go since I’d picked that place after researching it. I saw a dive-y looking sports bar up the block. I decided to try my luck, and ordered a cider from the bartender without incident. Relieved, I stopped to look around. I was sitting in between two very cute guys watching the Dodgers/Cardinals game. It was the bottom of the 9th and the Cards were up 10 to 9, and the guy to my right wore a Cards jersey. A chocolate potato donut from Tasty n Sons. After the Cards won, I got to talking to him. His name was Kyle, he looked like Ryan Gosling, and he lived nearby. The night was suddenly looking up. He had to leave to go see a band play in SE Portland, but he asked for my number since I told him I didn’t have set plans yet. I gave it to him, not really expecting him to text me later, but thinking that it was nice to be asked all the same. I sat and finished my cider before walking outside. I saw a tall man and a blonde woman sitting at a picnic table outside the bar and sheepishly asked them which way was south. They told me, and then politely asked where I’m from since that was clearly not a normal question Portland residents typically ask each other. I ended up staying and talking with them for a couple of hours. We even stayed after we were forced back inside the bar when the outdoor seating closed around 11, when karaoke began. The blonde girl, Anastasia, killed it with her rendition of Fleetwood Mac’s “Dreams” and then asked me to text her my number so we could meet up the next day. She works for Voodoo Donuts and told me to stop by and see her at their second location, Voodoo Too, before her shift ended. Anastasia and her friend Michael were probably my favorite people out of everyone I met in Portland, even though I liked everyone a lot. They just took a lot of time talking to me about the city and themselves and they were eager to help and make sure I had a great time in Northeast Portland. The weather in Chicago for Friday, in contrast. After I felt like I was winding down for the night and ready to leave the bar, Kyle texted me. I decided to go meet him and his roommate since they were so close. We all sat on their porch talking and drinking before the roommate went to bed. Kyle and I stayed up talking for a while longer and he just turned out to be a really interesting guy. He’s a St. Louis transplant so we talked a lot about the Midwest. He’s in Portland working 40 hours in his field but also going to grad school so he has hardly any free time. I wondered how old he was and asked — he was 24, which made me feel a little old. I left his house and went back to my airbnb, happy to have met so many people who were willing to entertain an out-of-towner. It was fun being invited into Portland homes and seeing what they are like. It sounds like almost everyone lives in a house rather than an apartment. Kyle rents a huge house with four other people, which sounds a lot like college to me. Anastasia shares a house with several roommates too. The bike couple in Ladd’s Addition was a little older, maybe in their 30s, so I suspect they own their huge, beautiful home. Portland, Day Three will be posted later this week. The famous “Keep Portland Weird” sign downtown. I am still on my vacation as of today, and am flying home tomorrow afternoon. I’ve been writing about this amazing adventure, and while it’s all too much for one post, I like the idea of posting a series about what I’ve been doing out here in the Pacific Northwest. It’s been an experience and I am so glad I came here. I hope you’ll take the time to read why, as I continue to post installments of this series this week. For now, here is an account of my first full day in Portland, after arriving in town around midnight the night before. I woke up my first morning in Portland early, still stuck on Central time. I showered and got ready to grab the #71 bus to transfer to the #4 to go to Southeast Portland. A woman in Ladd’s Addition had agreed, via a female cyclist message board, to let me borrow one of her bikes for the week. In my initial post, I had offered cash or barter, and she picked the latter. I brought her some toffees and chocolates from Amy’s Candy Bar and had these in my backpack. A restaurant in SE Portland — I didn’t eat here, I just thought it looked cool. I waited for the bus and used its texting tool to see when it was due — at 8:29, in just seven minutes. I looked up and saw a young boy with a musical instrument case coming to the same stop. I remembered then that it was a Thursday, and thought 8:30 seemed awfully late to be leaving for school. I told him what the text had said, and he thanked me. I asked him a couple of questions about the bus system, and he was surprisingly knowledgeable for a 7th grader. I told him I was visiting from Chicago and jokingly asked where I should go. He actually had a lot of good suggestions. A Plaid Pantry in SE. These convenience stores were everywhere. I got to Ladd’s Addition a little early, so I went to a coffee shop nearby. A woman greeted me right away, and I saw the shop was empty aside from the two of us. She asked what I wanted, and recommended a pumpkin latte, which I accepted. I dug into my backpack for my wallet, but couldn’t find it. I thought I must have left it on my bed at the airbnb. “Never mind that latte actually,” I said apologetically, and explained I must have left my wallet behind. She offered me a cup of regular coffee on the house instead, which I gratefully accepted. I talked to her a for a bit too, taking down suggestions and names of places to see. I thanked her for the coffee and moved on to April’s. April and Phillip live in a gorgeous, huge home in Ladd’s Addition and have a sweet older dog named Foxy. They gave me a series of bike maps and April helped me select which of their many bikes might fit me best. She and I carried it downstairs from their attic and Phil showed me on the map the best way to get back to my airbnb. The best way, it turned out, had at least eight steps, and once I was out on the road riding, I realized I’d only been able to remember the first four or five. I got a little turned around but managed to get back to the airbnb. By now I was starting to feel worried about my wallet, because I really had thought I’d grabbed it before leaving. The view overlooking one of Portland’s bridges near downtown. I parked the bike and walked into my airbnb, a sense of dread forming in the pit of my stomach. I looked at the bed — the wallet wasn’t there. I froze, then immediately began tearing the bed apart, then the rest of the room, then the bathroom, in a fruitless attempt to do something, anything. It was gone, and I knew it. I checked my bank’s website and saw that no charges had been made to my Chase debit card, or to my Chase credit card I’d packed as an emergency back-up. I looked up the nearest Chase branch and found one about a mile away. I have to admit, I am so glad I use Chase, since it’s everywhere. I walked into the Chase with only my checkbook as some small form of proof. I explained I was from out of town and had lost my wallet. I sat down with a banker, a man around my age, and he was unbelievably helpful. He explained he couldn’t just issue me a new debit card on the spot because I’m from out of state, but he rush-ordered a new card to my airbnb, which he thought should get there Saturday. He also let me withdraw cash so I wouldn’t be completely screwed. I got out $250 since that’s about what I’d budgeted for the first few days in Portland anyway — the things on my Portland to-do list were mostly cheap eats, coffee shops, and breweries. It hadn’t occurred to me yet when sitting at that bank that my hopes for trying a wealth of craft beer were now pretty much dashed, sans ID. While I was at the bank, I got a text from Sarah, my Chicago friend who happened to be traveling to Portland at the same time with her fiance Andy. I had written earlier that I’d felt oddly possessive of my time in the city of Portland and hadn’t wanted to share it or my experience with anyone I already knew, but let me tell you, when I got her text and remembered they were there, I was flooded with relief. Right then I wanted nothing more than a friendly, familiar face or two. Everyone in Portland had been incredibly helpful and polite, but I really needed a friend. I needed someone who knew me and could sympathize and confirm that this was absolutely a horrific thing to have happen while traveling and just let me complain. A mural near the food truck pod, around 9th Ave and Washington. That’s exactly what happened. I got on the bike and met them downtown at a food truck pod — a solid block of food trucks — and gave them big hugs. They commiserated with me over a picnic lunch of sushi, Transylvanian food, and grilled cheese (my contribution, I’m a little ashamed to admit — I needed comfort food). It was all delicious, but we agreed the sushi was the best of the three. I admitted to them, and in a way to myself, that I was kind of in Portland on a scouting mission. They seemed to understand, because they loved Portland, too. I told myself a long time ago that I would never move to a new city/state again because, while I’m so glad I moved to Chicago, it was much harder than I thought it would be. I’m not saying that I’m moving to Portland, and there a lot of reasons not to. But I have to admit, I like the idea of it. If I were to do it all again despite my past experience and my better judgement, it would be to Portland. Sarah and Andy were staying in the Pearl District, but they were leaving the next morning for a friend’s wedding in Ashland, Oregon. Sarah recently became the owner of Women & Children First, Chicago’s famous feminist bookstore in Andersonville, so she was interested in speaking with the owners of In Other Words, the store Portlandia’s Women & Women First is based on (and filmed at). The store may be based on Portland’s, but the name was definitely pulled from the Chicago store, after all. Sarah wanted to talk to them about their organization since she’s a new small business and bookstore owner, but it was at least three miles north. We walked to a bike rental place to get bikes for her and Andy. At the bike store, I asked someone to take a look at the front of the bike April had lent me: A bracket holding up the front light had snapped an hour or so earlier, on top of everything else, and the light now just danged by a thin cable. I’d tied my earbud cord around the light to try to hold it down, but it was not ideal. They couldn’t replace the bracket without ordering one, but they zip-tied the light to the rack on the front of the bike to at least keep it secure. We all rode up Williams Avenue most of the way to get to In Other Words and parked right outside. We went in and it was clear that the show shoots the interior scenes there as well, and not just the exterior, like I’d assumed. A signed Portlandia poster hung on the wall by the register. Sarah found lots of things to buy, while I just picked up three small ‘zines I thought looked funny. I also grabbed an In Other Words bookmark and a couple small buttons. We talked to the volunteers there and learned (well, I learned — Sarah already knew) that they were holding an open meeting Sunday to decide whether or not to close. I was sad to hear it. On top of being a feminist bookstore, they are also a community center, offering services and classes to the area. They said the show had brought them a lot of business and publicity, but that it is still a tough business to be in. They’re a nonprofit but it’s hard to retain devoted volunteers and the ones who are involved now are putting in almost as many hours as they would at a full-time job. Inside of In Other Words. We made our purchases, got lots and lots of photos, and left. On the way out, Sarah asked if I have a passport. I told her I did, but that it was in Chicago. Then we realized I could ask Adele to look for it and mail it. I texted Adele immediately and thanked Sarah for the great idea. On my bike ride home I stopped at a Trader Joe’s to get a cheap dinner and some snacks for the room. Without thinking, I grabbed a cheap bottle of wine too. The woman at the register asked for my ID, and I said I didn’t have it. She was so apologetic, but said she couldn’t let me purchase it anyway since she’d asked. I told her I completely understood, but thought to myself that if there was ever a time that called for wine, the day I lost my wallet on vacation was that time. I went back to my airbnb and reported my lost wallet to Trimet, Portland’s version of the CTA. I looked into whether or not it’s possible to get on an airplane without an ID (it is, but it’s unpleasant), and I also looked at prices for later flights home from Seattle for a day or two later. They were a minimum of $500 and I had no way to place an order online, even if I had an extra $500 set aside. I texted Stef and Jaimi and told them what happened. They immediately offered assistance and moral support, but I told them it could have been much worse. I know it sounds naive, but I honestly don’t think my wallet was stolen. Whoever had taken it would have had at least two hours between that bus ride and when I went to Chase to cancel my cards, but no charges charges were made. It was clear to me that the very worst part of this was losing my ID. I had to hope a car didn’t hit me on my bike because no one knew me or could identify me. I couldn’t fly home from Seattle, or anywhere. I couldn’t buy wine at Trader Joe’s or tour a brewery. That said, I tried my luck that night at a dive bar two blocks north of my airbnb. No one carded me at the door or looked twice when I ordered. I talked to some locals there who patiently answered my Portland questions. One even gave me his email for later, in case I think of anything else. Portland, Day Two will be posted later this week. As soon as the weather hints that it might get warm soon, and sometimes long before that’s a possibility, my brain gets completely preoccupied by the thought of traveling. I love hearing about new cities, I love reading travel blogs, and I love looking at other people’s vacation photos. I usually try to plan a trip during the summer, but this has been a crazy one, between settling into my new job, not having vacation time until July as a result of said new job, and planning an apartment move. When my high school friends stayed with me here in Chicago a few weeks ago on the first night of their road trip to Idaho to go to our friend Jesse’s wedding, I thought I was going to die of envy. A drive across the country sounded so perfect, and I lived vicariously through them thanks to Facebook posts and pictures. Someday I too will see the Badlands. Nothing is set in stone yet, but I’ve been approved for time off the first week in October, and Southwest has a great sale running until the 17th, so: Portland, brace yourself. I’m getting airfare Wednesday and I’ve got my eye on a great place in North Portland that I saw on airbnb. My family made a point of taking a trip most summers, the biggest ones of which were our two-week trip to England/Wales/Scotland but also our cross-country Amtrak train ride. Until this past weekend, I was under the impression that I’ve never been to Portland, but my dad told me Sunday that our Amtrak train left us there at the end of our train trip. We only spent the day there though, and I was 11 and clearly wasn’t paying enough attention because I don’t even remember going to Powell’s. 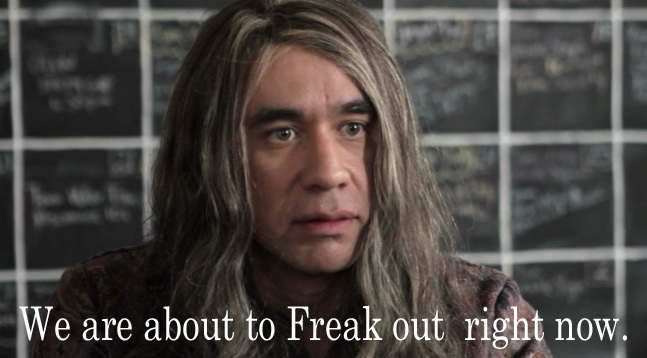 I’d be lying if I tried to act like I’m not going to Portland because of “Portlandia”. That show makes it look like a beautiful, magical, amazing place and I will probably be let down by how grounded in reality the city actually is. But I don’t care about that right now. I’m going to stay in Portland two or three nights, then either rent a car or take the train north to Seattle, stopping in Olympia, Washington on the way to see my cousin Paul. Then I’ll stay with Evan in Seattle for one night, or maybe two, depending on what all I fill my Portland itinerary with and how much availability he has that weekend. I’ll stay by myself at an airbnb place like I mentioned, and I’ll rent a bike and tour the city. I’ll drink amazing coffee and eat gourmet scones and donuts and hike and see waterfalls and visit neighborhood bars and make conversation with strangers — hopefully in between spurts of writing inspired by the gorgeous scenery of the Pacific Northwest. I’ve never been on a vacation to a city where I didn’t know anyone, by myself. It feels like a very freeing, independent, adult thing to do. I can’t wait. I joke about my love of “Portlandia,” but it really has helped me cultivate this strange affection and attachment for an area I am not familiar with. I’ve been wanting to visit Portland for a long time, and I’m glad I am finally making it happen. Thanks to Jaimi for helping me accept that this plan is not weird — or even if it is, it doesn’t matter, because it’s going to be spectacular.